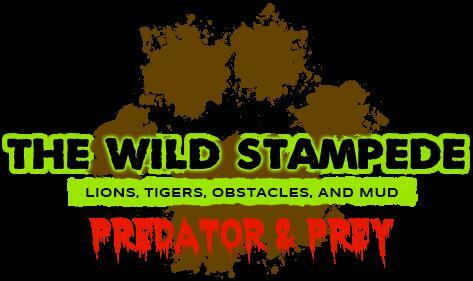 The Wild Stampede: Predator & Prey is a 5k mud-run/obstacle course event presented by Legend Race on Saturday, March 1, 2014. Plan to run like a gazelle with a lion in hot pursuit! The event will be held at the Conservators’ Center, which is located just north of Burlington, North Carolina. This nonprofit haven is home to 90 exotic animals representing 19 species, including more than 30 lions, tigers, leopards, and wolves. Known for its unique obstacle course designs and affordable pricing, Legend Race offers mud-run experiences that are fun for first-timers, with plenty of challenges for experienced athletes. We are proud to announce that proceeds from this event will help support the Conservators’ Center’s efforts to preserve threatened species through educational programs, responsible captive breeding, and rescuing wildlife in need. You will not be running near the animals, but on the Center’s wooded property adjacent to the fenced facility in which they are housed. When you finish your wave you can enter the gate and visit the animals at no additional charge. You are guaranteed a unique, close-up view of these powerful, majestic creatures…often from just 5 feet away! We encourage you to bring family and friends to cheer you on. You can purchase a pass for $15 that will allow up to 4 people to join you when you visit the animals. There will be tasty food, locally brewed beer, and lots of other reasons to hang out at the Conservators’ Center after the race. NOTE: Due to the nature of this event, all participants must be at least 15 years old. Those under 18 must be with an adult. Finger Lakes Mud Run at Everest Park 2014 Registration Now Open!